Initial performance on 17th January 6pm at the Michaelis Theatre, Roehampton, with further showing of work at Coventry University, Dartington and Estonia and France. Wild Card returns with more specially curated evenings from a new generation of dance makers, bringing fresh perspectives to the stage. For each Wild Card, an up-and-coming artist is given the opportunity to present their own work alongside works by artists they admire. Katye is a dance artist practising as a performer (Station House Opera, Florence Peake), curator (Decoda), maker and teacher (Coventry University). One of her latest works, the running intervention (to) Constantly Vent was recently presented at the Hayward Gallery. Her practice reaches across forms and communities, informed by the belief that thinking happens differently when it is located in dancing or moving. Improvisation is a core aspect of her work, as is collaboration. 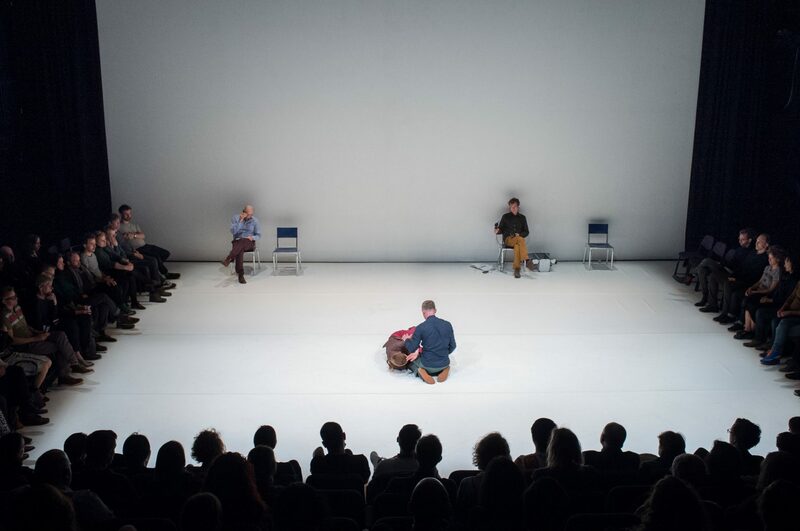 This evening is curated by Katye in conversation with Charlie Morrissey, dance artist and collaborator (Steve Paxton, Siobhan Davies). Katye has anchored this evening through key questions in their evolving duet, where we are not. The performers’ visceral presence makes visible the live-ness of decision making. Sound artist Graeme Miller and philosopher Alva Noe will also contribute works igniting the idea of ‘preparation’.